November 19, 2010 -- A radiology professor at the Case Western Reserve University School of Dental Medicine has developed two iPhone/iPad apps designed to enhance the teaching of anatomy on panoramic radiographs and craniofacial cone-beam CT images, according to a presentation November 18 at the American Academy of Oral and Maxillofacial Radiology (AAOMR) annual conference in San Diego. Wisam Al-Rawi, BDS, MSc, MS, an assistant professor in the department of oral diagnosis and radiology, teaches radiology to sophomores at Case Western and was trying come up with new ways to engage the students. "I asked them one day, 'How many of you have an iPhone?' and half the class raised their hands," Dr. Al-Rawi told DrBicuspid.com. "There were no apps for teaching radiology, so my colleague Hytham Al-Obydi and I decided to create one." 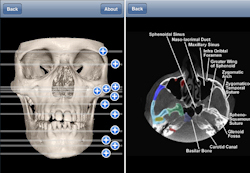 Their first app, iCBCT Anatomy, uses some of the inherent features of the iPhone -- such as "pinch and zoom" to explore each image in detail -- plus offers an interactive quiz mode that can test the user about each structure in the image. Click here to enlarge this image. iCBCT Anatomy features an interactive quiz mode. All images courtesy of Dr. Wisam Al-Rawi. "The whole idea is to make it simple to use -- and fun," Dr. Al-Rawi said. "If I tell my students to read a book, well ... but if I offer them this app, they will be all over it." iCBCT was developed and tested on a MacBook Pro laptop using Apple xCode development tools and the iPhone SDK to build the graphical user interface and to program the app. 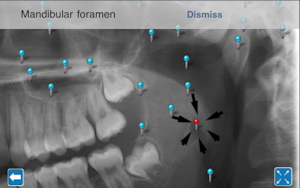 They used Adobe Photoshop to process high-resolution panoramic radiographs from Planmeca ProMax and Soredex Scanora, and added labels, arrows, and colors to highlight or outline an anatomical structure. iCBCT can be downloaded from the iTunes App Store for use on the iPhone, iPad, and iTouch. It currently has more than 1,000 users, according to Dr. Al-Rawi. iPanoramic pinpoints key anatomical features in pano images. "It's used by dentists as well as students, even some physicians," he said. "Some users say they use it to teach their patients." ICBCT Anatomy has been so successful that Dr. Al-Rawi has developed a similar teaching tool: iPanoramic. This app, which was submitted to the iTunes app store on November 12 and is still awaiting approval, is designed to pinpoint key anatomical features in a panoramic image. When the user clicks on a pinpointed feature, a window pops up with the name of that feature. Ultimately, Dr. Al-Rawi and his colleague intend to add a button to the screen to provide more information about each feature, he said. iPanoramic is available in English, Brazilian/Portugese, and Spanish, Dr. Al-Rawi noted, and he is hoping more users will join in to translate the apps into other languages. "Whoever translates the app will get credit for it on the app itself," he said. Dr. Al-Rawi and his colleague are also working to make the apps available on the Android platform, he added.